You’re running a business. Chances are communications are a big part of your day-to-day life with clients, suppliers and staff and that the bulk of those communications are electronic. Emails, text messages, chat channels, forums, Google Docs and social media are all part of a constellation of conversations and content that make up many corporate communications ecosystems. With small businesses making up the overwhelming majority of the workforce (in the U.S. firms with fewer than 500 workers accounted for 99.7 percent of businesses according to data from the Census Bureau’s Annual Survey of Entrepreneurs), there are bound to be a lot of scattered communications systems cobbled together to get the job done cost-effectively and with as little friction as possible. This past year has seen both a major reckoning on this point in the wake of the Facebook-Cambridge Analytica scandal, (with the personal information of 50 million users being affected,) and a monumental response in the new General Data Protection Regulation (GDPR) legislation, giving consumers more power -- and, consequently, businesses more reasons to be both vigilant and concerned -- than ever before. What do I need to know about the GDPR? Where can I get checklists and tools to help me with compliance? How can a communications hub help me meet GDPR requirements? 1. What do I need to know about the GDPR? The General Data Protection Regulation (GDPR) came into effect this year on May 25th, strengthening the rights of individuals to hold those who collect and store their data to account like never before, with a promised heavy enforcement that includes fines of up to €20m (£17.5m) or 4% of the company’s global turnover for those who breach it. How will it affect my organization? While consumers are bound to relish their new empowerment in the wake of the Facebook - Cambridge Analytica scandal (more information here and here) and Google’s recent admission of their own multi-year data breach (resulting in the end of Google+), this powerful new legislation has many businesses worried and scrambling to ensure they’re in compliance. In the simplest terms, the directive states that companies must let their customers know why they hold their personal data, and set out what data is held and how this data will be used. They must also be sure to store it securely. But the GDPR is legislation covering the European Union and my company isn’t even there. While the GDPR directly impacts the 28 countries that currently make up the EU (Austria, Belgium, Bulgaria, Croatia, Republic of Cyprus, Czech Republic, Denmark, Estonia, Finland, France, Germany, Greece, Hungary, Ireland, Italy, Latvia, Lithuania, Luxembourg, Malta, Netherlands, Poland, Portugal, Romania, Slovakia, Slovenia, Spain, Sweden and the UK) it is not limited to businesses operating within those countries. 2. Where can I get checklists and tools to help me with compliance? The expectations of the GDPR are going to mean digging deep into your organizational practices and ethics and acting on them transparently. Not ready? You're not alone. According to Gartner less than 50% of the organizations impacted by the GDPR are likely to be compliant. This legislation has a very broad impact, and one that can't be solved with a simple checklist to ensure your company is compliant. It's intended to instill a larger sense of corporate responsibility for the way that personal information is collected, stored and handled. There are, however, a handful of terrific resources to get everyone from your marketing department to your CIO and security and risk management leaders where they need to be. codeinwp's "6 Key Steps to Ensure GDPR Compliance – The Steps You Need to Take Right Away"
ZDNet's marketing department lifesaver "GDPR compliant? Here's a handy five-step preparation checklist"
You can find the full text of the official GDPR broken down section by section on the web with a downloadable PDF. TechRepublic's "Best practices for reducing GDPR liability" video in under 10 minutes. 3. How can a communications hub help me meet GDPR requirements? 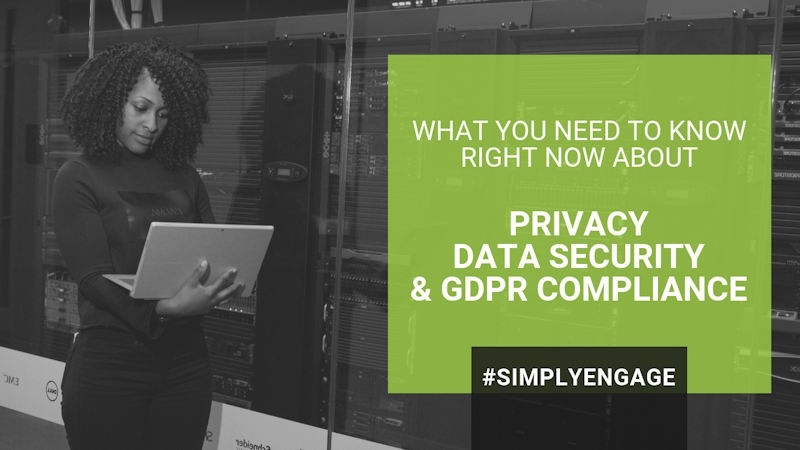 It can be a headache to accurately inventory and map all of the data the GDPR requires you to protect, and to act on requests to correct and erase personal data, when it's not only stored on your own network but also on those of various cloud providers. At InspireHUB, we've made it our business to do these things well. We know how important it is to both protect client data and privacy and to ensure the conversations and content that drive your internal and external communications are safe as well. Our IHUBApp lets you create content and also integrate a variety of third-party tools (calendars, YouTube videos, Google Docs and Sheets, Salesforce, and more), manage access to and share that content from a centralized hub that supports the transparent management of consent throughout the customer life-cycle and helps your organization provide the evidence required to prove that your IT security program adheres to the GDPR.